Ecommerce is money. Wherever there are money, there are thieves. Keeping your store secured is very important nowadays. Even though Magento itself constantly improving its security yet there is still more you can do to protect your Magento installation. By following these simple steps you can make your Magento 2 store secured. Do you keep your Magento up-to-date? This free service gives you a quick insight in the security status of your Magento shop(s) and how to fix possible vulnerabilities. MageReport.com is made by the Magento hosting specialists of Dutch provider Byte. With a dedicated team of 40 skilled colleagues, we protect performance and security of several thousand Magento shops. Even if your site has top notch security it still can crash for various reasons like data center power-off or hard drive error. To prevent data loss you need to have a backup. Think about activating backup plan for your server right now. Backup frequency depends on the amount of orders you receive. It can be even hourly backups. store.com/admin would be the first thing hacker will check. Admin panel can be abused be hackers, for example they can launch the brute-force attack. 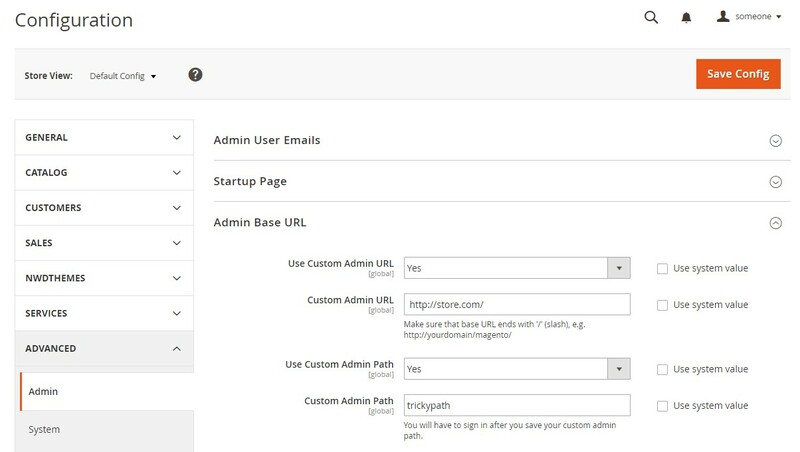 Luckily it is pretty easy to setup custom admin path. In the panel on the left, under Advanced, click Admin and expand the Admin Base URL section. Enable authenticator support for the Admin. Manage and configure authenticator settings globally or per user account. Reset authenticators and manage trusted devices for users. Magento team constantly working on improving the system. New versions include security patches, performance enhancements and user interface improvements. Usually you will see new version notification in admin panel. If for any reason you cannot upgrade to the latest version, make sure to install all security patches as recommended by Magento. In the panel on the left, under Advanced, click Admin and expand the Security section. Admin Session Lifetime = 3600. Time for user to be idle. System will logout user after 1 hour. Lockout Time (minutes) = 30. Number of minutes to lock an account before the user can log in again. Helpful against bruteforce attacks. Password Change = Forced. Require the users to change their password before it expires. That’s the basics of Magento security. Remember that store security is owner responsibility. 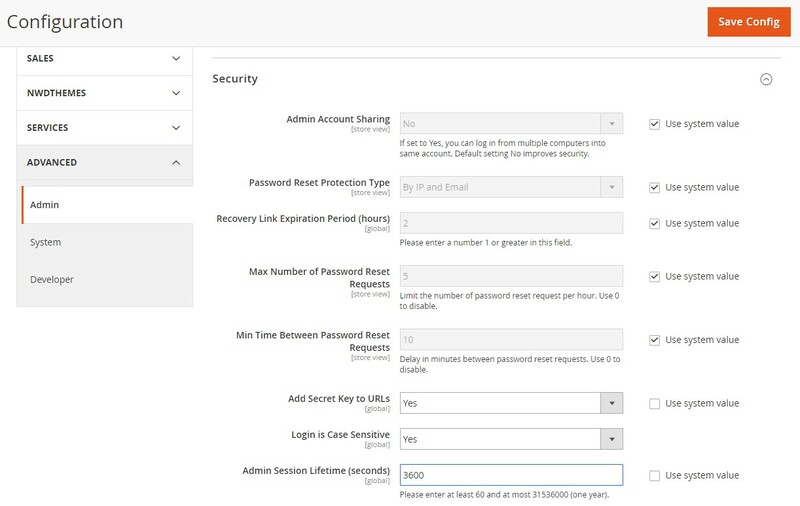 Configure your admin security effectively. Share your security tips in comments. I would also suggest businesses to update to the latest Magento 2.2.6 version to stay protected. This version has fixed more than 25 security vulnerabilities.